Good Morning! I am not going to say a word about the weather.....but just go feel your card stock....that says A LOT! This card will be entered into the Challenges at; Power Poppy, CSI (copy, steal, inspire--but not really steal), Scrapy Land, Anything Goes! Stamping Sensations, Anything Goes! and Penny Black, Anything Goes, With A Stamp. I found this pretty card on the Power Poppy Must See Customer Creations, it is by Patti's Stamping Studio (her Blog has been removed from the interwebs). A little free hand paper piercing using an oval die as a guide, half a doily backdrop. Green Gingham Ribbon, double bow--impressive! Button and Twine for accents. I cropped the sentiment, removing sip by sip. LOVED Patti's color and design.....if she's out there I hope she sees this! Thanks for coming by the crime scene! Love the purple with the green! Your embossed background is beautiful and I love that doily! The button is a great addition to your card. Thanks for sharing with us at Scrapy Land Challenges! Purple and green make an awesome color combo. Love the focal image, embossed background, half a doily and the impressive double bow. Gorgeous, Donna! I love the purple and green combo and that beautiful gingham ribbon. Fabulous embossing, too. Thanks so much for joining in the "Anything Goes" challenge at Scrapy Land this fortnight. Hope to see you for our next challenge also. 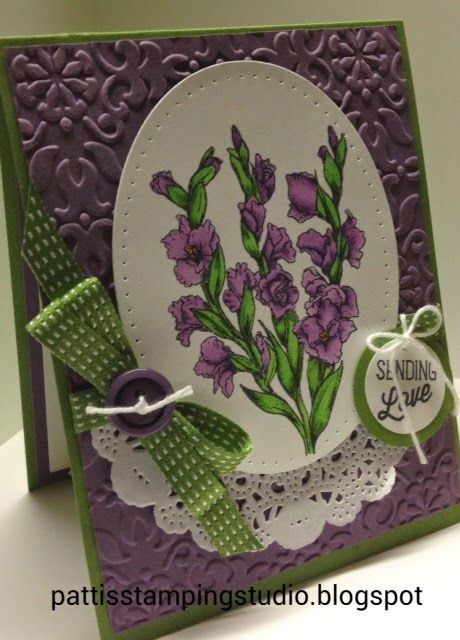 A super creation and great design and colours Donna, many thanks for joining our August challenges at Stamping Sensations and Penny Black and More. Your card is really pretty. Gorgeous colour and I love the embossing and the doily, both so pretty. Like most of the others, the colors are what hit me first. In a good way. They are so bright and beautiful together. The design, using half a doily is really eye catching and love the elements what you added. Great job finding this beauty to CSI. This is so beautiful, LOVE that pretty purple background and how you have used the doily. You have captured Patti's card perfectly. Great coloring, I have that stamp and haven't gotten it inky yet. You have inspired me...well one!!! This is darling! I like the colors, textured background and your short stacks look awesome. Thanks for playing in our Power and Spark challenge this month. Love this beautiful card with the embossed background (and I love purple:) Perfect with the added detail of ribbon, bows and doily. What great layouts and I love the colours you used - beautifully coloured too (purple is a fav of mine!). Thanks so much for sharing with us at Penny Black & More. Oh, Donna, what a fabulous CASE of Patti's card! I love the colors you've both used, and I love the image you chose! Beautiful double bow too! It's stunning! Hugs, sweet friend! Love the Short Stacks featured with purples!! I would have never thought of using them that way and wish I had!! What a striking card! !